Princess Charlotte Augusta of Wales, daughter of King George IV. 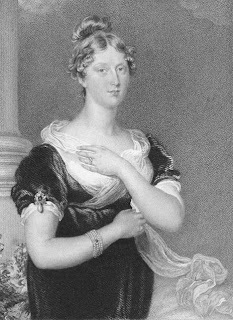 Princess Charlotte, Caroline of Brunswick's daughter. I knew the minute I posted that you gals would be to smart for this! Never would've gotten that one! Good job ladies...such smarties! Hi Amy...there's a catch... us smartie ladies all read the same book: Indiscretions of the Queen!! You are all such smarties! I had no idea! Of course I'm stuck in Tudorville. I guess it's time to break out a bit. Alas, Tudorville is tough to break out of though. Friday Fans Want to Know: Who would you want? Oops! It’s Wordy Wednesday again! Inquisitive Friday Fans Want To Know! Touch Base Thursday, eh, what? Let's play a game with Wednesday Words! Happy Birthday Caroline of Brunswick!